Throughout the eighteenth century, Italy was an important center for the production of decorated megillot and ketubbot. The art of both utilized a similar vocabulary in which columns, archways, cartouches, garlands, and urns were depicted, and a rich palette of reds, blues, and greens was employed. In terms of style, this scroll resembles the illuminated ketubbot produced in Ferrara and Mantua. 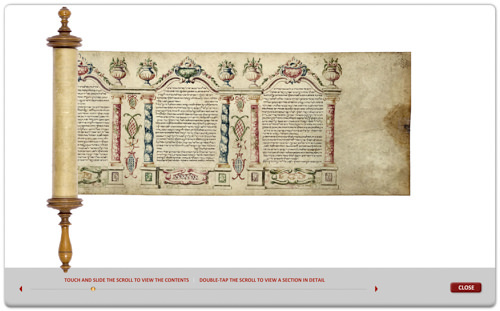 This megillah is embellished with delicately hand- painted, repeated architectural designs. The text is set between alternating straight and spiral marble columns. The Jews of Italy associated twisted columns with those of the Temple of Solomon, which they believed were brought to Rome by Titus and eventually placed in the Basilica of St. Peter in the Vatican. Spiral columns, consequently, were used to decorate objects of Judaica including megillot, ketubbot, synagogue textiles, and title pages of Hebrew books. 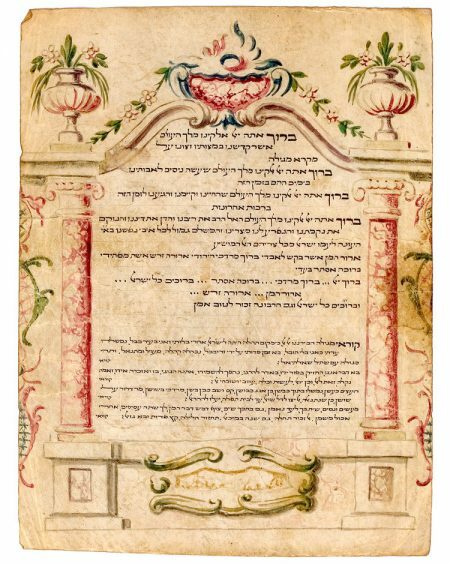 This sheet also includes the benediction recited at the conclusion of the reading of the megillah that acknowledges God who “exacts vengeance for His people Israel from all their foes, the God Who brings salvation.” The rabbis decreed in the minor Talmudic tractate Soferim (14:6) that this prayer be followed by a declaration in which the righteous are praised and the wicked are condemned: “Blessed be Mordecai, blessed be Esther, blessed be all of Israel, Cursed be Haman, and may Harvonah be remembered favorably.” Harvonah, the king’s servant, a minor character in the Purim story, alerted Ahasuerus to Haman’s plot to hang Mordecai. For this small, but pivotal, contribution to Haman’s downfall, the rabbis included him in this passage. Sabar 1993, pp. 21–23; Shachar 1981, no. 411.